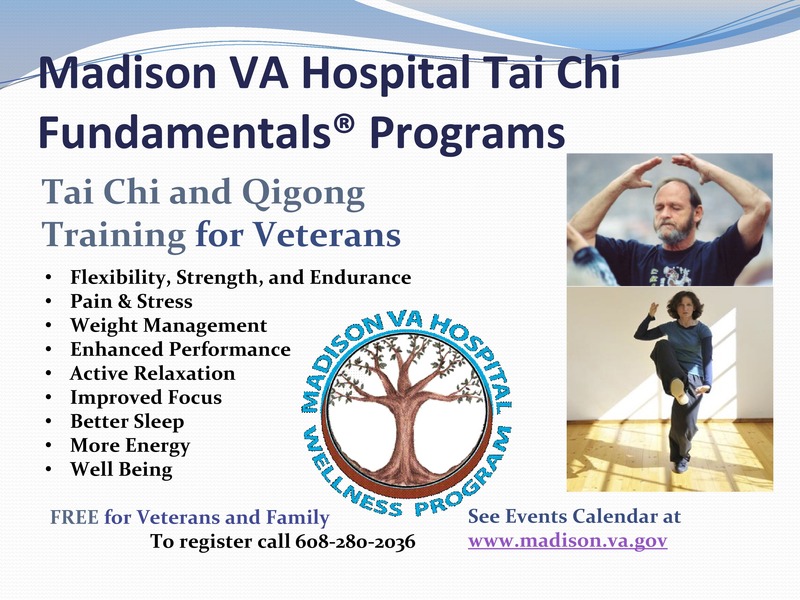 Tai Chi Fundamentals® has been taught at a number of VA sites including: William S. Middleton Memorial Veterans Hospital, Madison, WI, Clement J. Zablocki VA Medical Center, Milwaukee, WI, Oscar Johnson VA Medical Center, Iron Mountain, MI and Truman Memorial Veterans Hospital, Columbia MO. 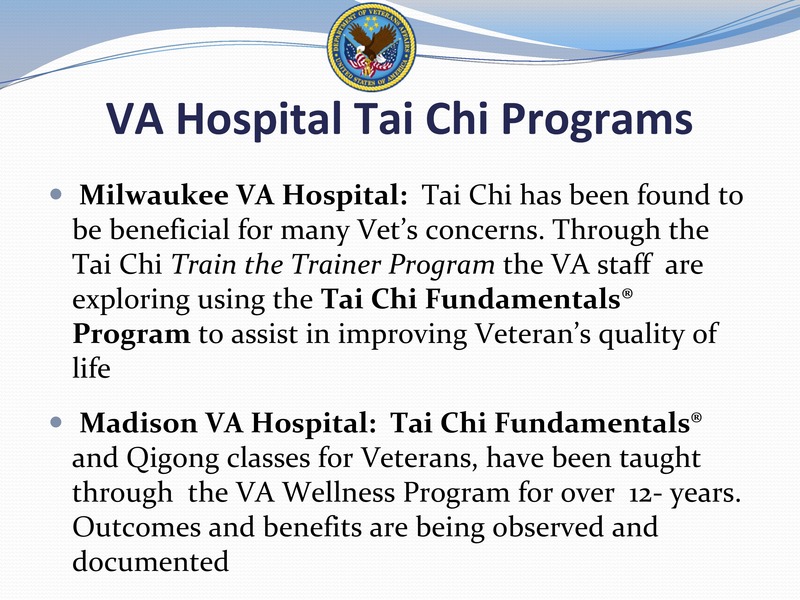 Evidence Map of Tai Chi from Department of Veterans Affairs Health Services research and Development Service. 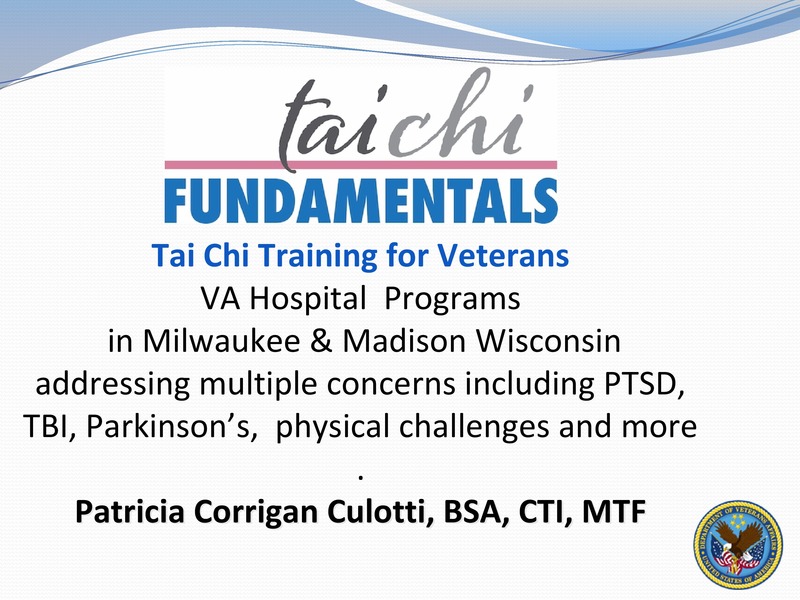 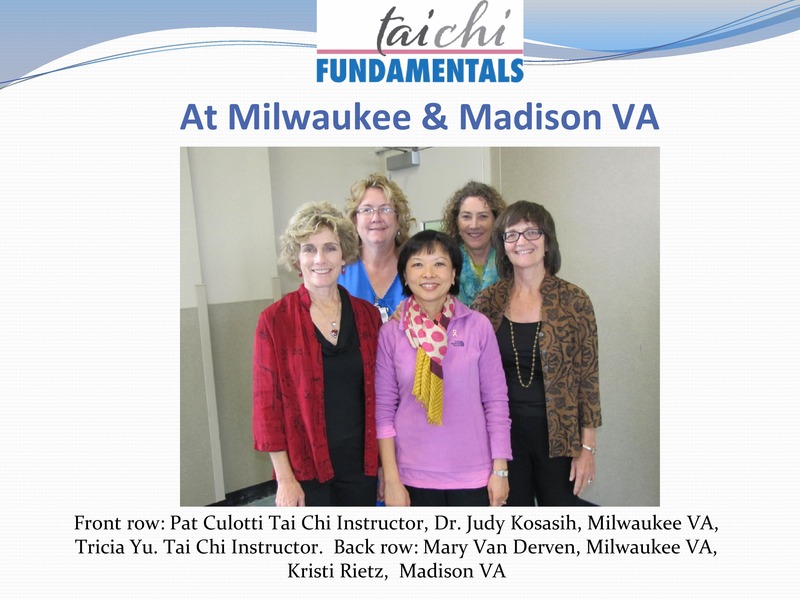 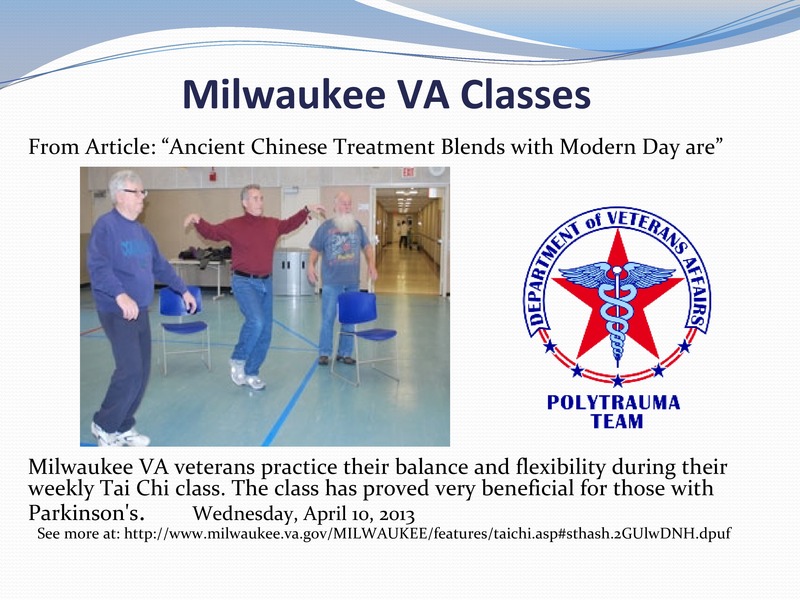 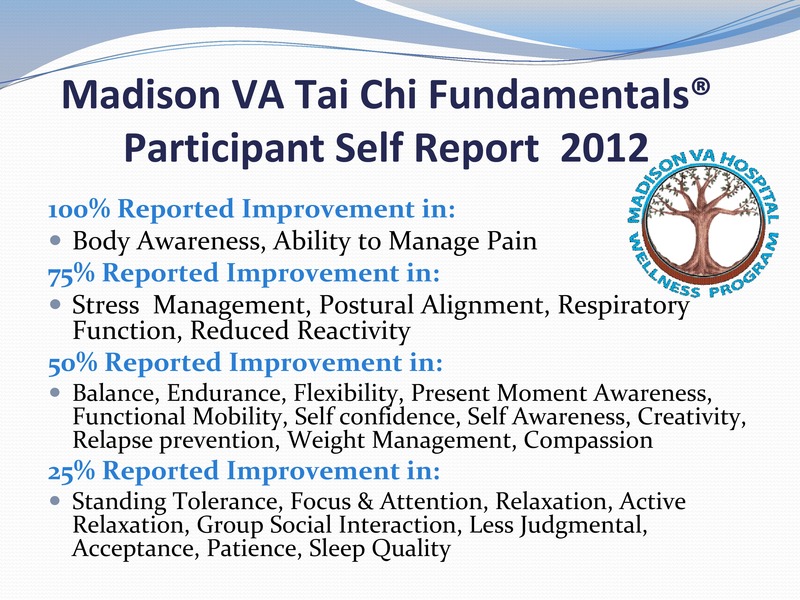 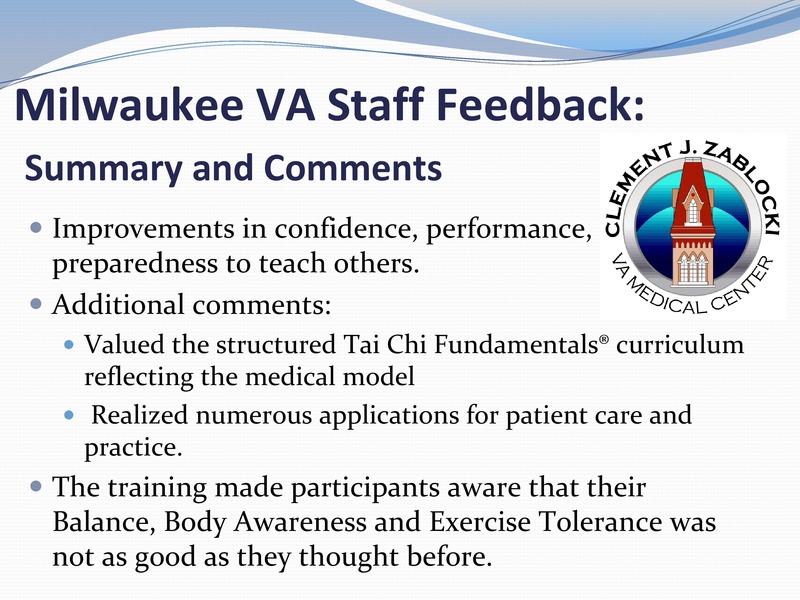 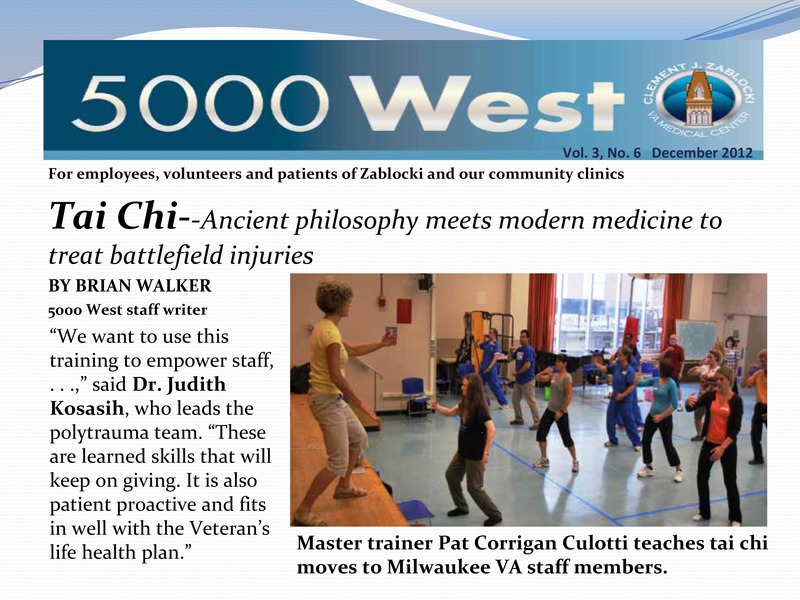 View slide show on Tai Chi Fundamentals® programs currently taught at VA hospitals in Madison and Milwaukee, WI. 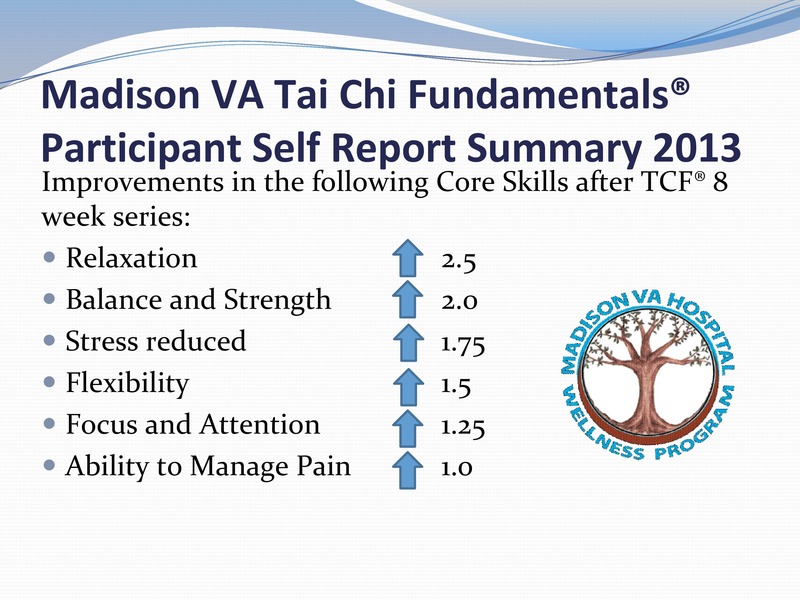 The Tai Chi Fundamentals® Program was featured in the Self Care Tool Kit DVD for U.S. Military Medical Providers worldwide. 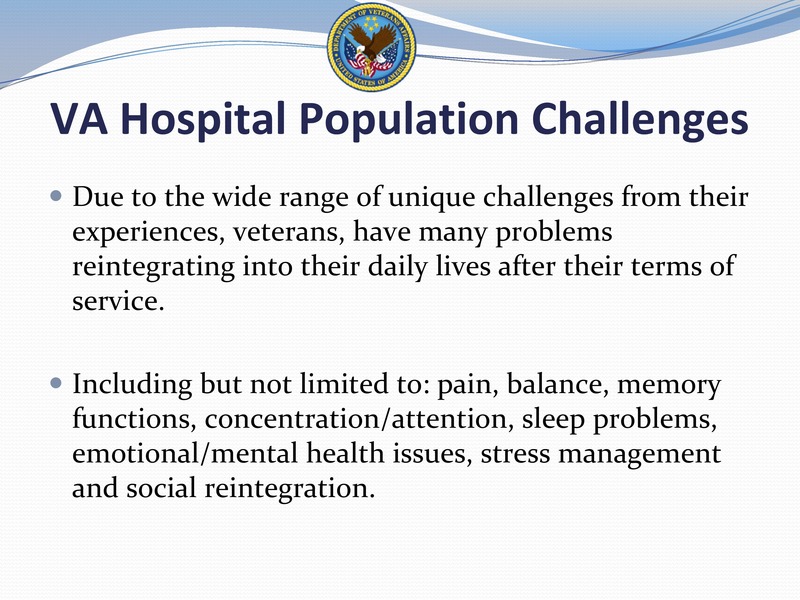 Conferences include U.S. Army Force Health Protection Conferences 2009, 2010 and the Armed Forces Public Health Conference 2011. 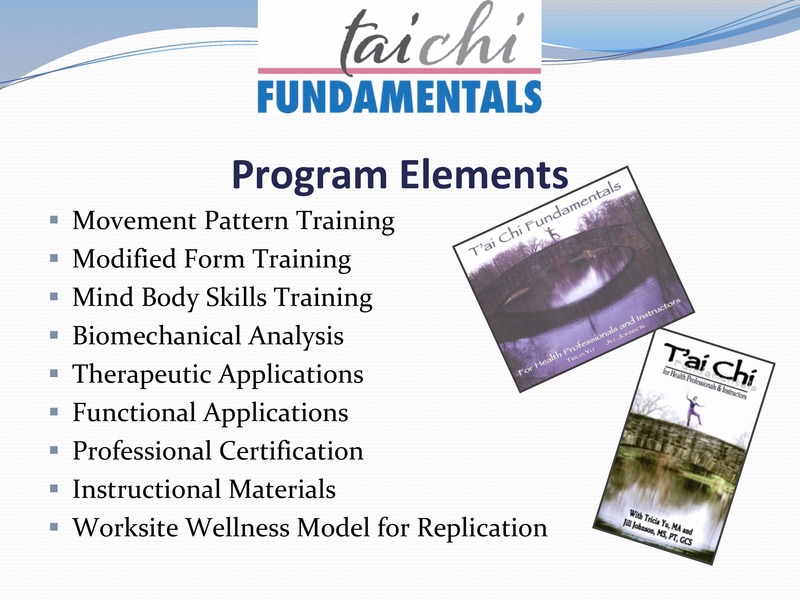 This presentation investigates Tai Chi’s mental and physical applications for fitness training, function and therapy. 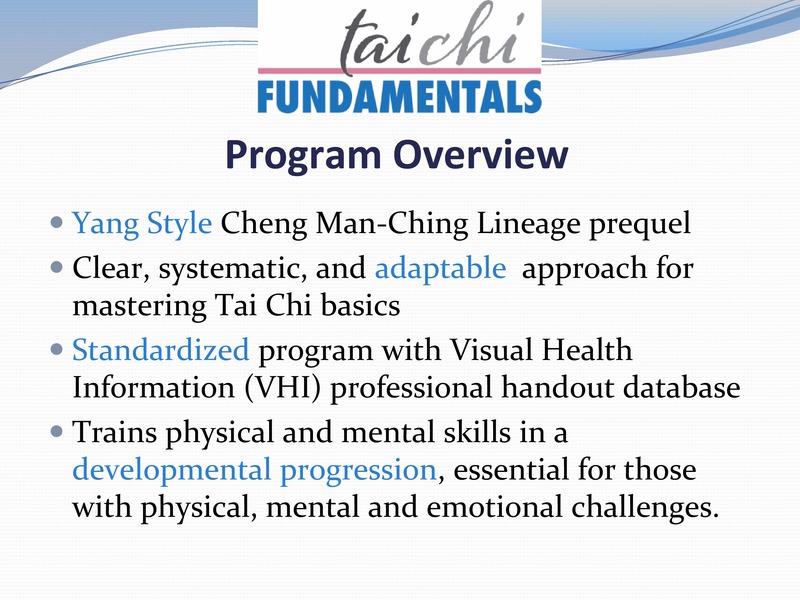 Tai Chi Mind/Body Fitness Skills Part Two – A Model for Military Base Implementation of Tai Chi TrainingThe Lifestyle Program Tai Chi Fundamentals®classes at the Centers for Disease Control and Prevention (CDC) in Atlanta have to date delivered Tai Chi instruction to over 700 employees. 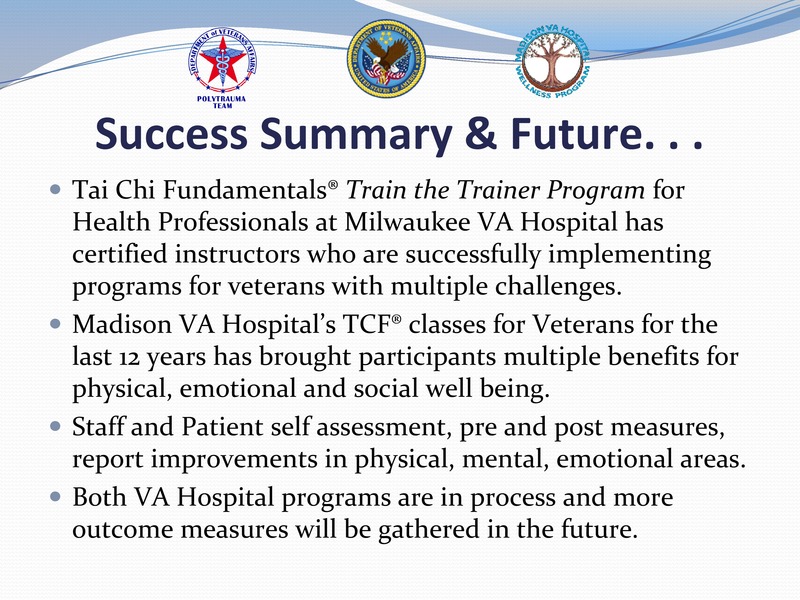 This program provides a model that can be replicated in other worksites, including military installations.